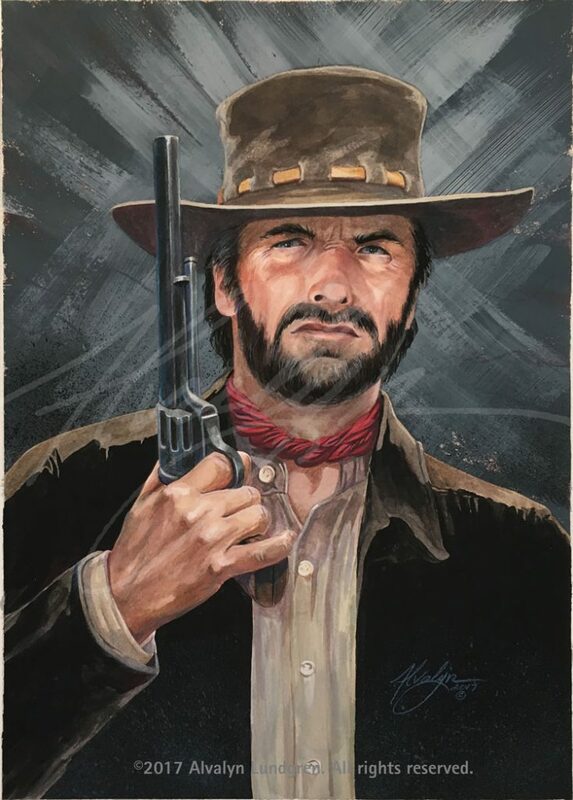 In developing more in the Western and cowboy art genre, I created this work based on Clint Eastwood’s character in the film, Hang ‘Em High. The color scheme is neutral with a pop of red. Mixed media include transparent watercolor, gouache and colored pencil on paper. Plus shipping and sales taxes. Matte and frame are not included. Open edition giclée print. Printed to order with pigmented inks on archival, matte-finish archival paper. Watermark is removed on print. Print size: 12 x 17 inch artwork on B4 (13 x 19 inch) paper. Shipping: Ships in 5-7 days via USPS priority mail. US only. Purchase does not include copyright. No rights transfer. The print may not be reproduced without my permission. Watercolor, gouache and colored pencil on paper. Size of original is 12×16 inches. Price includes sales taxes and insured shipping. Includes certificate of authenticity signed by the illustrator. Blue Steel is ©2017 Alvalyn Lundgren. All rights reserved.